Do you have an Android? 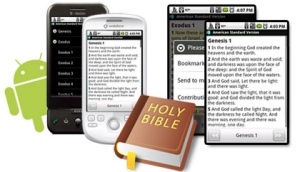 If so I’d love to hear what you think of this free Bible application! I am glad there is a version for the android platform I have been using my blackberry version at church since I can search it more quickly and with practically every translation it doesn’t matter what church I am at when I’m traveling I can follow the sermon anytime. Try the NIV Bible by Tecarta. YouVersion is pretty cool. It allows access to a lot of translations. However, if you do not have a good internet connection, it doesn’t work. I prefer a good offline bible such as this one from Tecarta. Do we have Mathew Henry’s Commentary on Android Platform? HTP Trophy Windows 7.Is there a Youversion available yet? Normally I don’t read post on blogs, however I wish to say that this write-up very pressured me to take a look at and do it! Your writing taste has been surprised me. Thanks, very great post.